Drool. 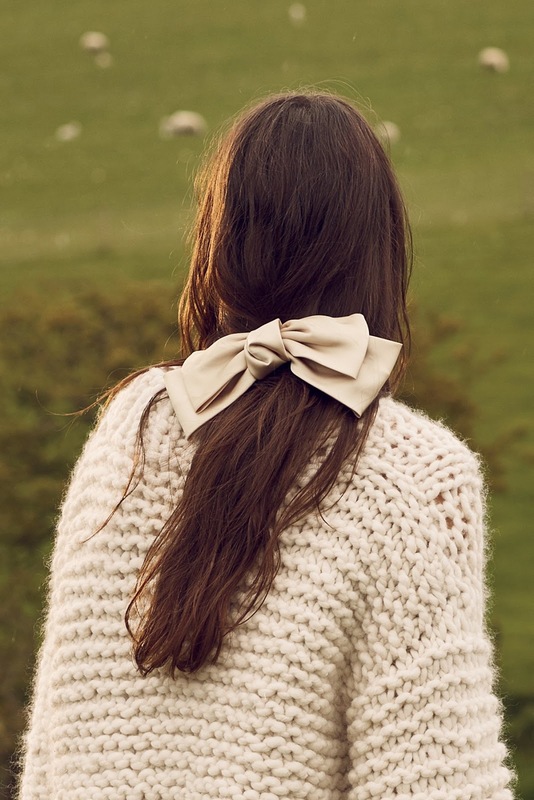 Although not actually Anthropologie, there is a store that’s keeping me delighted as Fall approaches. That store? Free People, who is ever more embracing a grown-up point of view that never crosses the line into dowdy or boring. 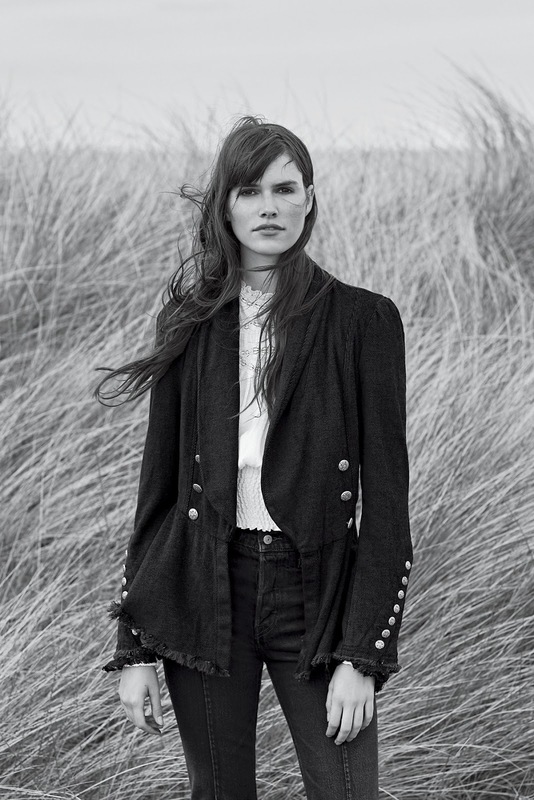 Could it be that Anthro is having a midlife crisis of sorts and pretending to be younger than it is, whilst Free People continues confidently and boldly moving forward into self-assured, individual style? Whatever the reasons, I don’t really care. All I know is that FP’s last two catalogues are getting me excited about clothing again. I’m not going to pretend like Free People is as wearable as I’d like — some of their stuff is certainly head-scratching and they purport to appeal to 18-to-28-year-olds, but a lot of their stuff is very pleasing right now and can easily be tweaked to take the boho flower child factor down a bit and make them city chic or better yet, preppy chic, my absolute favorite style. I’m putting together an outfit ideas post featuring FP to prove it. In the meantime, let’s pore over some delightful eye candy, shall we? Starting with the Pavlo Dress ($128), above, which comes in three colors and has tights delight written all over it to me. From fabulous boots to perfect dresses, there is a whole lot to love. Although a little crazy, how wonderful is this outfit? The Time Traveler Top ($68) shown here could easily be worn over jeans or a cute skirt for a simpler, chic look. Although part of me wishes I was brave enough to pull off this outfit as-is! When I was a kid, embroidery was a very popular denim trend, and I’m delighted to see it back in-style as an adult. 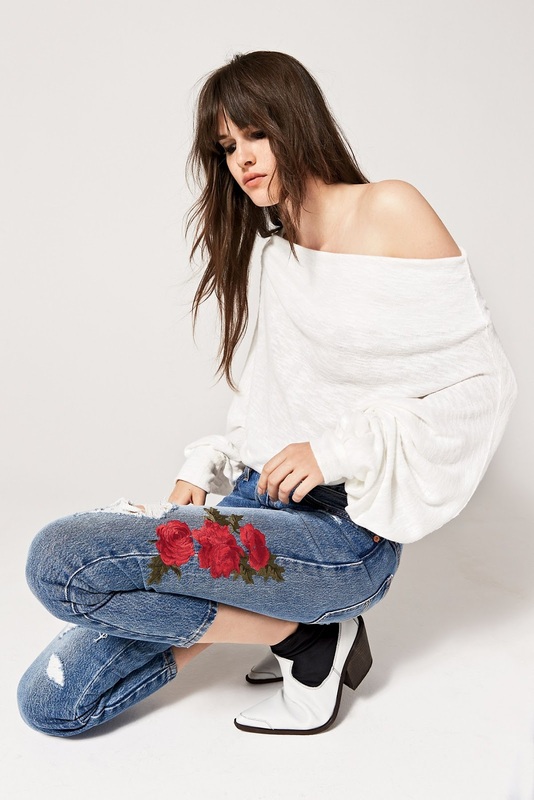 Some of the interpretations have been too juvenile for me but Free People has done an excellent job with their selections, like the Jackie Embroidered Skinny Jeans ($128), shown in white above but also available in two denim washes. If you like the embroidered trend as much as I do, I also recommend checking out FP’s Kelly Embroidered Baby Bootcut Jeans ($128) which features two floral embroideries, the beautiful Embroidered Bird Jean ($128), the light wash Eva Embroider Flare (now $70), the Bird of Paradise Scallywag Skinnies (now $130) that are especially gorgeous in black, the lovely Farrah Embroidered Flare ($138), the ultra-cute Kate Skirt ($118) which I may need in both washes and the Knock Out Ankle Boot (now $70, because not everything embroidered needs to be jeans. I’m so very in love with the Wanderlust Dress ($228), shown here with the Retro Moto Belt ($48). Although a little more oversized than I’d like this dress and the catalogue shot setting take me back to happy, dog-ear times of Anthro days yore. I adore it! Layering is one of Free People’s greatest talents, and this look is no exception, with the Eyelet Flare Dress ($370) shown over the Sweet Secrets Turtleneck ($40). The We The Free Dahlia Thermal ($68) and Mona Lisa Maxi Skirt ($148). Free People always has great layering thermals — the We The Free Laguna Thermal ($68) and We The Free Pacific Thermal ($68, on me here and here) are two more favorites. The Walk Me Home Dress Set ($168). Loving the hard and soft combination in this look, featuring the Heartbreaker Mini Dress ($228). The sage color of the dress is beautiful, too. The Every Little Thing Top ($78), pretty from the back and the front. Though it’s unrealistic I’d ever wear all this together, the combination is full of ideas. Shown are the Ember Pullover ($320), the Cooper Studded Flat ($168) and the Peek-A-Boo Printed Fishnet Tight ($28). Loving the cuff details of the Sweet Thang Layering Top ($68). Fun jackets abound in options like the Seamed And Structured Blazer ($198). The Flared Sleeve Blazer ($168), which also comes in a tobacco red/brown. and the Charlie Hi Top Converse ($60). Cute hair accessory? Yes please. as either a long duster, or on its own as a dress. Another cute embroidered jean makes its appearance, the Levi’s 501 Cropped Taper Jeans ($98-$128). Here with the We The Free Skyline Thermal ($68). The Anthro-esque Hearts Are Wild Mini Dress ($148). The fun, warm Juno Shearling Coat ($1,200). The long, layerable Riverside Tunic ($68) is beyond cute and comes in three shades. An unexpected delight awaits in the Madeline Wrap Top ($98). Shown here with the beautiful Valencia Flat ($100). More August Free People favorites in the boutique below. What’s on your FP wishlist right now? Loving them SO much right now! The Flared Sleeve Blazer is on my list in the terra cotta. I really like the Eyelet Flare dress combo, but why is the dress $400? Mona Lisa skirt is pretty too. LOL, right there with you! Great picks all, I'm realizing that I neglected bags in this post which is a huge mistake. Oops! Loving everything!! I'm going to need some time to sort out final selections. And Roxy you totally tricked me with that title, hehe. Btw – have you heard about the new clothing lines coming to (and leaving) Target in September? Some locations have already changed the floorpan and created new racks that kinda look like closets. I have heard about it! I don't get to Target all that often, but I'm intrigued. Love your picks, added many to my wishlist. I like how they layer items definitely gave me styling ideas can't wait to see your outfits too. I love the first pic with the chickens it did remind me of older Anthro catalogue shots. I haven't worn FP clothing since I was in my 20's but there are some cute offerings. I agree the Flared Sleeve Blazer is stunning. Most FP clothing is too bohemian, low cut, or oversized for my petite frame and my lifestyle as a working professional and parent. I do love the top photo and the embroidered tunic, though I would never wear such clothing while tending to my own 4 chickens. These cute clothes are in no way practical for my real life, but it's fun to browse anyway. I love a lot of the dress selections but many are too low cut. I wish some of them would just be a bit higher, so I could wear them! I agree that a lot of their stuff is low-cut or short. For the low-cut stuff they make a lot of beautiful layering camis that can be layered underneath. For short stuff they have layering slips and slinky slipdresses with flowy hems that can be worn underneath for additional length. It doesn't always solve the problem but it helps on a lot of stuff. This is what I do. I buy a bunch of dresses and slips to mix and match. I'm usually wearing 2 FP dresses at a time. Solves the modestly problem, and it's fun! So funny that you say that–I had the exact same thought when I saw the new FP catalogue…"this is exactly what the Anthro catalogue used to be like…" Beautiful picks and many already in my basket, just need to make choices now! Those Jeffrey Campbell shoes! And that flared sleeve blazer! I even love the Time Traveler top. I was looking for the Valencia flat in the pink color shown in the photo above, but it is not there. Do you think it is coming, Roxy? It's either coming or already sold out online. I don't know which. I'm missing the "style by girl" that Free People used to showcase. Candy, Meadow, Sandy, Lou, and Ginger…Anyone remember those? Loved looking through the collections they would put together based on style and this Fall catalog reminded me of it! Recently have been shopping at Target much more. The Knox Rose brand is amazing and so similar to Free People but at a great price. I agree, Free People has some beautiful things lately. Looking forward to your outfit ideas post; what stops me from shopping there more often is that as a 30-something with a full-time conservative office job and a preschooler to chase after on weekends, I never know how to style the stuff to suit my lifestyle. I can't promise conservative-office looks, but I promise fun looks! Gorgeous catalog and shots…..just wish I was young enough to wear these styles….I am a 00 and in my early 40's and everything that is appropriate for me, is always too big–or too short! So fun to look at though!!! A bit off-topic, but I can't locate the link to sign up for a paper catalogue. Google was of no help, either. Assistance, s'il vous plait? For Anthropologie? Or for Free People? …but it looks like the page is blank. Oops! It was for Free People, but I got the same blank page. Darn! Just received the Free People Catalog in the mail yesterday. A-mazing! !